Cedric is rather lanky. At about 6 ft 4, he often needs to duck down under doorways, but at least he can reach the books on the top shelf! A pair of small round spectacles over his wide grey eyes somehow defy the laws of physics and don’t get knocked off his face or broken constantly. He tries to keep his short tawny hair neat but it always ends up messed up in some way, and not so that it looks cool. He is usually carrying a lot of books around wherever he goes…or possibly some suspicious looking artefact he’s just found. Personality: Rather…eccentric. And often hyperactive. 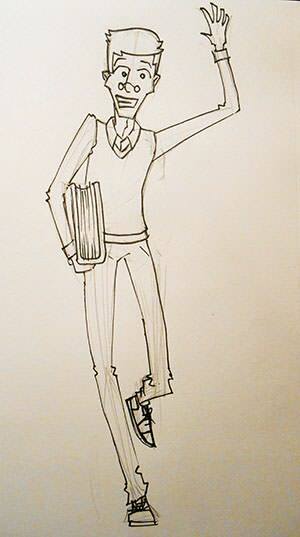 Cedric is as obsessed with his research as he is with the monsters and beings he studies. Whenever he meets a new being he insists on questioning them about everything. This can make them feel uncomfortable around him sometimes. Although his excitable and plain odd nature can make humans feel just as uneasy. That said, his friendliness is rather infectious and usually gets to people eventually. He often has his head in the clouds and seems to sort of stop working in serious situations. History: Cedric was raised by adopted parents as his biological parents had gone missing in the monster realms. Around the age of 14 he was contacted by someone from the department to inform him that he was actually the heir to an estate in a small pocket dimension - something even his parents hadn’t known about. Being the blue-sky thinker he was, it wasn’t hard at all to break it to him that all this weird magic stuff was going on. Although he seemed less interested in the dilapidated estate and more so in the existence of these monsters. He met Connor and they became friends quickly, being the only kids involved with the department in some way. Other: He seems clumsy and unbalanced but has surprisingly good hand-eye coordination. The office was pretty quiet as usual, with the only sound being the muffled footsteps of Cedric scurrying around the room next door, and the rumbling of the kettle. Connor heaped several spoonfuls of instant coffee into a mug, and as soon as the water boiled, poured it in and downed the drink in one gulp. The sleep deprived manager slumped into a chair and stared at a screen for a few minutes. “Stop. Put whatever that thing is down.” Cedric turned around and grinned awkwardly in response. “Pfft, it’s not dangerous, look.” He pulled the object out of the box. It was a black orb with golden skull ornaments emitting a dubious purple aura. Some kind of nightmarish chanting was emanating from it. A small bird perched outside the window was singing. The eye sockets on one of the skulls lit up and a jet of otherworldly energy shot out, vaporising it instantly. “O…K. I see your point.” Cedric said slowly, placing the orb very carefully in its box. He must have put it in the wrong way because something pressed down on it, and there was a clicking noise. The purple aura intensified and the whole zoo was flooded with ghostly wailing sounds for about 3 seconds. Everyone, including all the staff members, guests and even the monsters would hear this. He slammed the lid on and shoved it behind the monitor and in front of Connor, who looked as if someone had thrown their used gym shorts in his face. Several of the staff members had come running. “Itsfineeverythingsfine.” Cedric lied very badly. It was a calm morning in the office. Lestelle was humming happily to herself a she completed one of her evaluations of one of the new dragons who'd arrived earlier that week. She'd determined that he should likely be placed in an enclosure with only older males, considering that every time he saw a female he'd scream relentlessly in order to gain her attentions (it never worked, but for some reason he consistently continued with the behavior). Once the report was printed, she bound it with a clip and headed out of her designated office into the main room. Just as she rounded the corner, she witnessed a small bird disappear into a puff of feathers and ash. Lestelle, in shock from the sight, tripped over her own feet and crashed to the ground. Her report became unbound and papers fluttered around her. Embarrassment flooded through her. Had anyone seen? She scrambled to her knees and gathered the report, hastily clipping it back together (but not realizing that the front page was now upside-down). Her cool green eyes found Cedric just as an object in his hands flashed bright purple. Her head was filled with the wails of unknown creatures and, frightened, Lestelle let out a shriek and dove into the corner, hands on her ears. As quickly as it came, the sound disappeared. For some reason, these occurrences were rather normal. Lestelle, who was easy to fright, did not find them funny. Still needing to give Cedric her report, but wanting less than ever to have to talk with him, Lestelle inched around the perimeter of the room towards him and Connor. When she got within a meter, she tossed the report onto Connor's desk and scampered back to watch from around the corner of the hall. Connor grabbed the box just before the files hit the desktop, stood up very slowly, and left the room, climbing the stairs to the top floor. “Er, thank you. And er…sorry about that.” Cedric apologized to Lestelle, sitting down and beginning to sort through the files. “Oh, the new dragon, of course!” he said, eyes lighting up. “The new fella who screams every time he sees a female. I wonder why he does that, perhaps it’s some sort of mating cry for that particular species…” he continued to ramble to himself, regardless of whether anyone was listening. Meanwhile the cries of the monsters outside had grown louder all of a sudden. The door flew open and a distraught looking security guard - actually, the security guard as they had only found one person reckless enough to take the job - entered. “What the hell was that? !” he demanded. This was clearly directed at Cedric, as it was pretty obvious he’d had something to do with it, “The monsters’ve all gone crazy, and the Pegasus enclosure’s in crap shape, they’ll break out at this rate! Oh. Mornin', Lestelle.” he greeted the zoologist. He tried to be polite and friendly to everyone although Cedric's antics were just too much for him. Lestelle watched as Cedric read through her report. He was a strange man, but kind nonetheless, and out of everyone in the office he was the only one she felt some level of comfort around. "It might h-have something to do with his up-upbringing," she offered, still speaking to him from around the corner. "Supposedly he s-s-spent some of his childhood with griffins, which may explain his... pec-culiarity." He was rambling to himself, so she wasn't sure if he heard; nonetheless, it was all speculation and at this point it mattered very little. As if the zoo hadn't been loud enough before, it now boomed with the voices of the enclosed monsters. Lestelle jumped like a frightened sphinx upon the entry of the security guard. She had few encounters with him before, mostly because she'd avoided him at all costs. "M-morning," she replied, breathless. "The Pegasus encl-losure?" She headed towards the door he'd come through, making a wide, unnecessary arch around the desks in order to avoid getting to close to him, and pressed out into the open air. She'd told the Repairs Department several times about the enclosure, but perhaps calling to them from down the hallway just wasn't getting through to them. Lestelle hurried as best as she could towards the enclosure, though she had to stop several times to veer out of the way of guests and staff. A long "ummmm" escaped her as she realized that the security guard had been almost right: the Pegasus enclosure was already missing a chunk from the top, just small enough to prevent escapees but large enough to cause a problem. Taking the radio from her belt, she lifted the receiver to her lips. "Um.... C-can someone from the R-Repairs Departm-ment come to the Pegasus encl-losure... please?" A slightly battered car parked into an empty slot in front of the zoo. Freda went out of it, humming a rather cheerful song. She took her handbag, closed the door and pushed her car key's button. She raised her brow, as no sound could be heard and pushed the button several more times. "Huh. Battery problems. Oh, well!" she spoke to herself, continued humming and locked her car manually. The big zoo stood with its powerful presence in front of Freda, who was in awe. "This is it," she whispered to herself. "Monster Zoo. My future workplace. As much as I know, it's not like the normal zoo parks. Which means... higher pay!" Freda entered the zoo and in a blink of an eye her smile wiped off her face. Her eyes widened in shock and her voice exploded in a shriek, as a unicorn was running in her direction. Freda bolted to her left. Very soon her legs were hurting and slowing down, as she was gasping for air. Apparently running after a six-year-old child and lifting heavy bags of groceries wasn't enough to keep one in shape. She jerked in a side direction several more times, as her speed had no chance in front of a whole horse power. Finally she fell down on the ground.